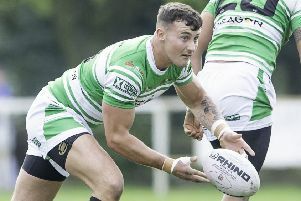 The Moorenders were unable to follow up their terrific derby victory over Morley the previous week with another success as they went down 50-36 in their final away game at Percy Park last Saturday. Cleckheaton did at least return from the north east with a bonus point and that keeps them four ahead of third-bottom side Bridlington going into the final round of matches. Bridlington gave themselves a glimmer of hope of avoiding the drop with a 28-17 victory over Bradford and Bingley and they must secure a bonus points win in their final game against Pocklington and hope Malton and Norton can do them a huge favour by winning handsomely at Moorend. The lead changed hands seven times in an entertaining contest at Percy Park with Cleckheaton going into the break 22-17 ahead. However, Park took an early second half lead and although Cleck scored again to lead 29-24, the home side added four further tries to secure victory. Survival is very much in Cleckheaton’s own hands and they will be hoping to celebrate come the final whistle with a barbecue and band planned to bring the curtain down on the campaign.